Ceimiceoir Albanach ab ea an Ridire William Ramsay (2 Deireadh Fómhair 1852 – 23 Iúil 1916). Bhain sé clú amach mar gheall ar a chuid oibre ar na triathgháis. I gcomhar leis an Tiama Rayleigh, d'fhionn sé an dúil argón sa bhliain 1894. D'aithin sé na dúile héiliam, neon, crioptón is xeanón, agus thomhais sé a n-airíonna. D'aimsigh sé argón (1894), héiliam (1895), neon (1898), criptón (1898), agus xeanón (1898). Bhuaigh sé Duais Nóbel na ceimice i 1904. 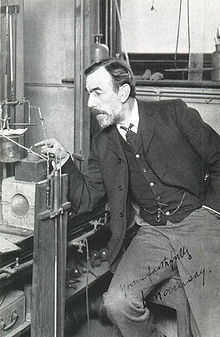 Rugadh i nGlaschú é, mac le William Ramsay, C.E. agus le Catherine Ramsay (a rugadh mar Robertson). Ba nia é don gheolaí An Ridire Andrew Ramsay. Rinne Ramsay a chuid staidéir in Ollscoil Ghlascú faoi Thomas Anderson agus ina dhiaidh sin chuaigh sé go dtí Ollscoil Tübingen sa Gearmáine, áit ar scríobh sé tráchtas dochtúireachta dar theideal “Investigations in the Toluic and Nitrotoluic Acids”. D'fhill Ramsay ar Ghlaschú mar chúntóir ag Anderson i gColáiste Anderson. Ceapadh é ina Ollamh le ceimic in Ollscoil Bhristó i 1879. Phós sé Margaret Buchanan sa bhliain 1881, an bhliain chéanna ar ceapadh é mar 'Phríomhoide' nó 'Cheannaire' ar Ollscoil Bhristó. Lean sé air ag déanamh taighde ar cheimic orgánach agus ar na triathgháis. I 1887 tháinig sé i gcomharbas ar Alexander Williamson mar 'Chathaoirleach na Ceimice' i gColáiste na hOllscoile i Londain. Fuair sé bás in High Wycombe, Buckinghamshire, i 1916. Tugadh an leathanach seo cothrom le dáta an 22 Iúil 2018 ag 21:08.